Fast forward one year. He’s back in his hometown, being swarmed by teammates after scoring the overtime winner against their biggest rival in a comeback win. “It was a pretty incredible feeling,” said McCrory, as he smiled ear to ear. He had just scored his second goal in two games after spending a full calendar year away from hockey. Before all of this, the Stingers’ new winger spent a season and a half playing for Bemidji State University, a small Division 1 NCAA school in the United States. As exciting as playing for a Division 1 program may seem, the experience wasn’t what the Montreal native had hoped for when he signed on. South of the border, McCrory found himself sitting out games as a healthy scratch more often than he was seeing the ice at the Minnesota school. The young forward ended up only playing in 16 games over two 41 game seasons. He was feeling discouraged, and certainly lacking in both confidence and the joy that the game had always brought him. After all, he is a hockey player; he wanted to play hockey. Eventually, the situation just became too unpleasant and frustrating for McCrory. He left Bemidji State and he thought, at the time, he was leaving high level hockey too. It looked as if, after nearly two decades of hockey, McCrory’s hockey dreams would be ending with his departure. Years of time on the ice, across three provinces and two states, were coming to an end. Luckily for both him and the Concordia Stingers, things didn’t go that way. When he got home, he heard from McGill and Concordia, both interested in bringing him onto their rosters. Stingers head coach Marc-André Élement called McCrory, offering him the chance to skate for the first time in months. By McCrory’s own admission, he was sloppy and out of game shape coming back to the sport for the first time since leaving the NCAA. But that ice-time was the start he needed to get his passion back. He signed with the Stingers and was ready to play. He spent his offseason time training with some current and future Stingers in Carl Neill, Chase Harwell, and Bradley Lalonde. Unfortunately, when it came to getting on the ice, it wasn’t smooth sailing. Because of transfer regulations in U Sports, the 23-year-old was forced to sit out the first semester of the 2018-2019 season. He could practice with the team and attend meetings but not play. His return to the game was delayed, again. “Waiting from January to January is a pretty long time, and it’s draining mentally to stay focused, hungry, and passionate. I kind of lost that when I was at Bemidji,” said McCrory of the time he had to spend away from playing. He may not have been playing yet, but McCrory knew this was a chance for him to get back to the sport he loved. He spent the extra time he had getting into the best shape he could to compete in the second semester of the season. He focused his energy into his workouts in the gym and getting to know his new team and potential linemates’ games at practices. Early in his time with the Stingers, that has worked out pretty well. In his first game, he scored his first U Sports goal against the Royal Military College Paladins during his first shift of the second period. After being away from the game for so long, it was a special moment. “I’ve never felt those kinds of butterflies after scoring a goal before. Even my first NCAA goal in front of  people […] it just felt different. Like ‘finally I’m back playing hockey,’” said McCrory. His teammates certainly appreciate his instant offence as well. The new forward has already made a real impression on those around him. “He’s flashy. You don’t see him for awhile and then he’ll pull off some cool moves. He brings some excitement to our lineup, it’s a scoring punch we obviously needed,” said Stingers alternate captain Carl Neill. McCrory has been standing out, and his Jan. 11 goal against McGill was, without a doubt, his biggest moment as a Stinger so far. McConnell Arena was packed; it was carnival night for McGill. Boos and chants filled the arena throughout the night as spectators celebrated the crosstown rivalry matchup. The game looked strongly in McGill’s favour after a first period, in which they led 3-1. The Stingers fought their way back into the game, tying the game at four late in the third period. When the game went to overtime, the teams traded chances until McCrory stepped onto the ice for the first time. His best strengths as a player were on full display with what came next: his speed, elusiveness, and goal scorers’ instincts around the net all came together. 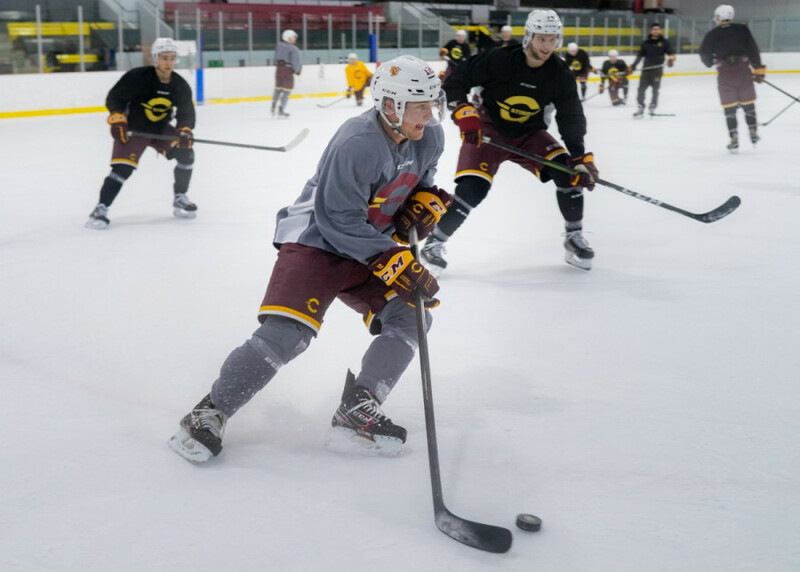 The rookie took the puck, skated through the neutral zone with speed, and showed just why the Stingers coaching staff trusted him in a critical three on three overtime situation where any slip up can easily roll into a loss. Crossing McGill’s blueline, McCrory burnt one defender, accelerating past him before spinning away from the defensive coverage, protecting the puck as he went. As the McGill defence tried to recover and gain possession, he forced his way to the front of the net. The first shot he sent towards the net bounced back, a pad save by goaltender Louis-Philippe Guindon. Pouncing on his own rebound, McCrory didn’t pass up his second chance. The puck found its way between McGill’s defenceman and Guindon, into the open net for the overtime win. “That was a good one, a huge one. He’s a goal scorer,” said Élement. As the home crowd groaned, the Stingers leaped off the bench, surrounding the game’s hero in a crowded mass of celebration and relief. What may have made this even more of a twist of the knife for the game’s home team is that before Concordia got in touch with him, there had been talks of McCrory heading to McGill. “That’s fun. Really fun. He played really well. I’m really happy he decided to come to us. He’s gonna be a key player for our team,” said Élement on McCrory being the one to end the game in overtime. As good as the personal success and scoring feels, being on a team where he knows he’s playing, has the coaches’ respect, and feels comfortable is something that Dylan McCrory deeply appreciates. 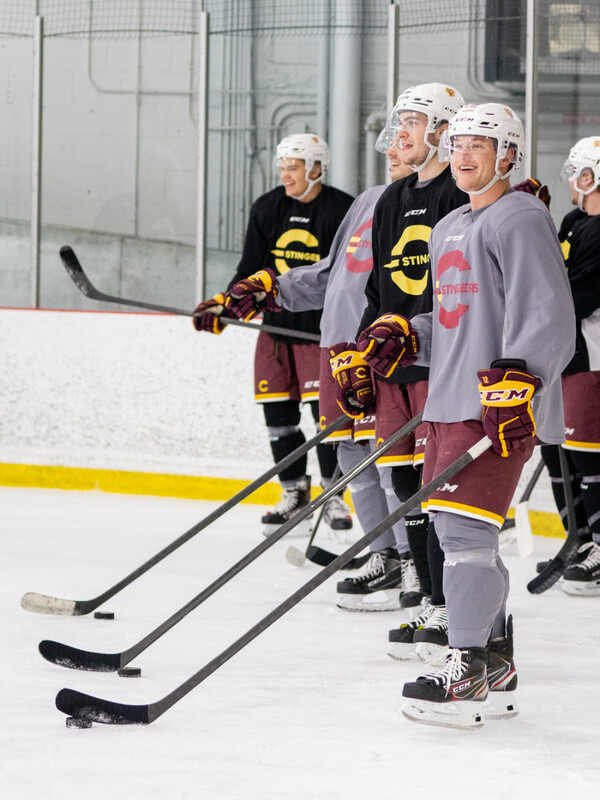 It’s letting him enjoy where he is right now and his work is helping the Stingers on a recent run of success as their season heads into its later stages. McCrory is feeling confident and excited about hockey again. His passion for the game is back and if he can keep up this pace, the Stingers may have found themselves a special player for years to come.